Everything Cookies are another great cookie to put in your children's lunch box or have as an after school snack. 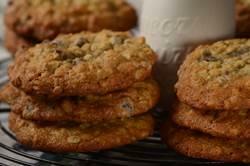 This cookie is like combining a chocolate chip cookie with an oatmeal cookie. In fact, they are much more than that, as they have just about everything in them - hence the name. They are sweet and buttery and full of nuts, chocolate chips, raisins, and rolled oats. So, a few notes on ingredients. There is always the question of what type of rolled oats to use in baking; old-fashioned or quick-cooking. Both start with oats that are cleaned, toasted, and hulled to become what we call oat groats. The difference between the two is in the thickness of the oats after the oat groats have been steamed and flattened. Old-fashioned rolled oats are thicker than the quick-cooking rolled oats. Either type can be used in this recipe. For the nuts you can use walnuts, pecans, almonds, hazelnuts, etc. Instead of raisins, you could use dried cranberries or cherries or other dried fruits. For the chocolate chips you can use semi sweet, bittersweet, milk or even white chocolate chips. Everything Cookies: Preheat your oven to 350 degrees F (180 degrees C). Butter, or line two baking sheets with parchment paper. In the bowl of your electric mixer (or with a hand mixer), beat the butter and sugars until creamy and smooth. Add the eggs, one at a time, beating well after each addition. Beat in the vanilla extract. In a separate bowl, whisk together the flour, baking soda, salt, and rolled oats. Add the flour mixture to the creamed mixture and beat just until incorporated. Stir in the nuts, raisins, and chocolate chips. For large cookies, use about 3 tablespoons of batter to form the cookies (can use two spoons or an ice cream scoop). Space the cookies about 2 inches (5 cm) apart. Flatten the cookies slightly with your fingers so they are about 1/2 inch (1.25 cm) thick. Bake the cookies for about 12 - 14 minutes or until golden brown around the edges yet still soft in the center. The longer the cookies bake the more crisp in texture they will be. Remove from oven and let the cookies cool a few minutes on the baking sheet before transferring them to a wire rack to finish cooling.